Comments: Fuzzy jrock, nuf said. Ah, CUNE. Formed in July 1999, and led by vocalist Ryouzou, bassist Taizou, drummer Kimito and guitarist Kouji. 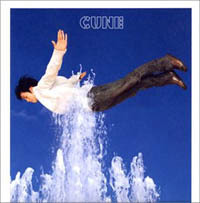 CUNE released their first album Great Splash in early December 2002. It's a twelve track album, with two tracks -- Butterfly and Samurai Drive -- from their indie period. If you're familiar with Bump of Chicken, then you're familiar with CUNE's genre: fuzzy j-rock. They're not your typical generic j-pop group, and neither are they the hard-core visual kei that has so generalized the j-rock scene. Border starts with Ryouzou wailing, and some guitar revving in the background by Taizou and Kouji. Kimito then joins in a few seconds later, drumming away. This is slow honest rock, and an excellent opening to the album. Border sounds a bit raw, but perhaps that is part of its appeal. Ryouzou's voice sometimes gets drowned out by Kouji's electric guitars, and at times, just doesn't seem to mesh properly with the music. Despite that, he sings it with controlled, almost lazy-like apathy, which, at the right moments, changes into a charged, soulful cry. This is without a doubt, my favorite track. Unlike Border, Ryouzou really hits his notes right with this one. Simple, effective lyrics, brilliantly put together, and a snappy grief-stricken chorus. This song is just painfully, and I repeat, painfully well done. Kouji's guitar solo in the middle of the song merely adds fuel to the fire. Needless to say, this is the song to look out for. After two excellent rock tracks, Clover is a bit of a letdown. It's a pop-rock track, sung almost monotonously, and sounds like your typical generic radio song. A cheesy chorus, complete with all four of them going "Ooooh Oooh" doesn't help. This track has some piano playing in it, which doesn't do much to save us from utter boredom. Nagareboshi starts out decently, with Kouji once again revving his guitars, and some synth in the background. The synth playing creeps its way quite obtrusively into parts of the song, much to my dismay. Once again, like Clover, this is a pop/rock track, perhaps edging more towards pop. Ryouzou sings it a bit higher here. Once again, nothing exceptional. When I heard this song, I knew, KNEW, that it had to be some sort of joke. This track is a ridiculous one-minute song with the most annoying chorus ever! "Aerobics Girl! Aerobics Girl! ONE TWO THREE FOUR AEROBICS GIRL!" Listen to this only if you're drunk. This track starts with an "Oooh!" and two "Bang! "s, followed by a few seconds of Kouji screeching his electric guitar. Ryouzou sings this with a deeper, almost teasing voice. Another pop-rock track, but this one has a jazzier feel to it. 1999-12-24 starts off quite well, but degenerates into yet another generic radio song. After four disappointing tracks, Inazuma revitalizes the hope that CUNE's first two tracks weren't pure fluke. This is a snappy foot-tapping rock track. Great guitars, enthusiastic drumming, and finally some good singing on Ryouzou's part. His highly-charged shouts of "Inazuma ga boku wo!" and his crazed infective singing at the end of the track make this song a worthwhile listen. Ah . . . a slow track, but one that comes out pretty well. Ryouzou sings this one a bit raspy, but with some quiet hopefulness. More synth, which meshes pretty well at first, then becomes a bit irritating. This is an okay track, but not something I'd like to listen to more than twice. The Japanese and their puns, sigh. Samasama Summer starts out excellently: slow guitars at first, and then followed by Kouji's electric guitars and Kimito's drumming. Ryouzou then joins in, sounding profoundly displaced, confused, and just generally down. This is a good, slow rock song, with an impressive guitar solo in the middle again. Samasama Summer comes out very well, and is another one to listen to. Butterfly is a track from their indie days. As a result, it doesn't sound as polished as it could be. Nothing really stands out much from this track. Ryouzou tries to do some charged shouting, but fails. Guitar-playing and drumming don't do much to save this track, and it feels like a chore to get through the whole four minutes of Butterfly. Slow, slow lullaby, innocent guitars, and drums that come in halfway through. Very slow. Very mellow. Ryouzou sounds raspy in this one, plus there is more piano playing. I don't really have much against this song, but at the same time, if this is supposed to be a night time lullaby, I'd choose my grandma singing over Oyasumi anytime of the year. Weeee... another snappy and noisy rock song. Samurai Drive is yet another track from their indie days. Ryouzou is drowned out by the guitars and drums, but manages to resurface every now and then. Nifty guitar playing in this one, but overall, not an exceptional track. Ryouzou has a nice deep voice, though he sometimes doesn't manage to hit his notes very well. Kouji's guitar playing however, saves him most of the time. Personally, CUNE sounds a bit raw and unpolished. Aside from Refrain which has impressed me greatly, most of their other songs are a bit of a let down. However, seeing as how this is their first album, I'd give them the benefit of doubt.